The Evolution Championship Series, commonly referred to as Evo, is the largest fighting-game event of the year. 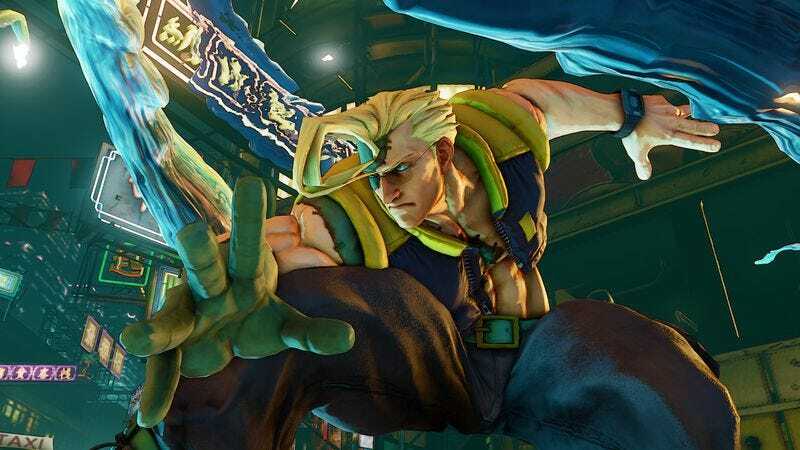 Every July, players gather in Las Vegas to compete in games like Street Fighter, Tekken, and Super Smash Bros., and Evo’s prestige and prize pool draws in the best competitors from all over the world. This was a transformative year for the event, which moved into the Las Vegas Convention Center for its first two days and the 12,000-seat Mandalay Bay Events Center for Sunday’s championship rounds. Those massive spaces were easily filled thanks to record-breaking attendance bolstered by Street Fighter V’s Evo debut, which drew more than 5,000 players. The finals of the Street Fighter tournament even aired on ESPN 2. With that much action throughout the weekend, there were bound to be tons of great matches and stories, but we’ve picked out a few highlights from the bunch that sum up the excitement and drama that Evo always brings. Mega Man is not a character you commonly see in competitive Super Smash Bros. For Wii U play. So when a Japanese competitor knocked the world’s best Smash 4 player out of Evo in commanding fashion using the Blue Bomber, it was a tremendous upset. Even though he’d end up coming in second to Ally, a top Mario player, Kamemushi stole the show with his unusual character pick and even more unusual tactics. Not only did he take down Zero, the Chilean Evo champ who’s been nigh untouchable since the game’s launch, he did it in a shut out, beating the scarfed wonder three dramatic games in a row. Despite being a dominant force in Marvel Vs. Capcom 3 for nearly as long as the game has been around, Christopher “NYChrisG” Gonzalez has continually come up short at Evo. The odds were stacked against him once again as he entered the final day of Marvel competition on the losers side of the bracket, meaning his next loss would eliminate him from the tournament. But after knocking out Justin Wong, another legendary player and one of his perennial demons, ChrisG fought his way to the championship match where KaneBlueRiver, the defending two-time Evo champ and seemingly unstoppable juggernaut, was waiting. Since Kane had yet to lose a set in the tournament, Chris would have to win two best-of-five sets in a row to secure his first Evo crown. After a shaky start, it was all ChrisG. He won six games in a row, taking the set in commanding fashion and capturing the championship he’d been sniffing since 2012. In recent years, five players have reigned over Super Smash Bros. Melee: Mango, Mew2King, Armada, PPMD, and Hungrybox. Of those five, Juan “Hungrybox” Debiedma is the odd man out. While his fellow Smash gods are known to bounce between a couple of top-tier characters, Hungrybox is a Jigglypuff specialist and has taken the pink puffball to unparalleled heights. The last two years, he’s come just short of the Evo championship, losing in the Melee finals to Mango in 2014 and Armada in 2015. After suffering his first loss of the weekend and being sent to the losers bracket, it looked like he might not even make it that far at Evo 2016. Not only did he fight his way to the grand finals—ousting Mango, a constant tournament favorite, on the way—but Hungrybox took Armada, the defending Evo champ, to the edge. Like ChrisG, Hungrybox was fighting from the losers bracket, and needed to take two sets in a row. Both series went down to the wire, but Hungrybox put Jigglypuff’s fatal Rest move to good use and stole the whole thing. Unsurprisingly, the lone American among the last eight Street Fighter V players was the star of ESPN’s Evo broadcast, and the producers couldn’t have picked a better representative if they tried. Joe “LI Joe” Ciaramelli is a famously caring member of the fighting-game community whose endearing backstory includes wearing a pink backpack in memory of his mother who died of breast cancer. While he’s had some success in Street Fighter V, no one saw this tremendous Evo run coming. To qualify for the final eight, Joe had to go through Kazunoko, a great Japanese player. He won in dramatic fashion—with the weight of an entire country already on his shoulders, he slugged it out until the last possible round and landed a devastating Critical Art attack to take the set. The crowd erupted and Joe fell to his knees, overtaken by emotion. He had made it to night three and would be competing on the main stage at the Mandalay Bay Events Center. After hearing he was in the top eight, Joe’s father flew out to Vegas without telling him and became a fixture on ESPN’s cameras, an extra emotional thread in this thrilling underdog story. But Joe’s Cinderella run didn’t last. He survived a tense first match (seen above), but it was Yukadon, the eventual third-place finisher, who emerged from Joe’s nail-biter of a final set. The American hero held his head high in defeat, thanking the thousands in attendance and promising his top-eight rivals had not seen the last of him. After Joe’s heartbreaking loss, the tournament’s odds-on favorite, Infiltration of South Korea, collided with a popular dark-horse pick, Japan’s Fuudo. With the explosive offense of R. Mika on his side, Fuudo took the set, but Infiltration wasn’t out for good. He had the chance to fight his way back to a rematch with Fuudo in the championship match. Naturally, Infiltration eked out the win and was right back in it. This final match was a slugfest, with the competitors trading off dominant beatdowns until Infiltration pulled ahead and secured the first set. Riding that momentum, the Korean phenom took an early lead in the second set, and while Fuudo showed some signs of life, he wasn’t able to claw his way back. Infiltration took the biggest fighting-game tournament in history with a German suplex into the corner. After the match, he threw a little shade at Fuudo in one of the weekend’s most memorable moments. When asked what adjustments he made to his game plan that allowed him to come back and take Fuudo down after their first encounter, Infiltration needed only two words to set the arena on fire: “download complete.” He had seen enough of Fuudo’s play to know what he was going to do and when he was going to do it, and Infiltration used that information to dismantle him.